What am I currently loving these days? 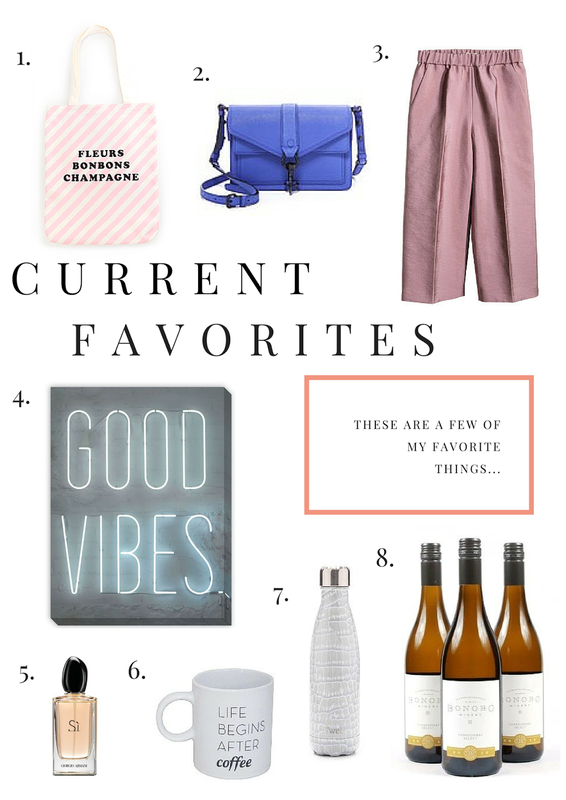 With new releases and some new favorites here are some of my latest obsessions. What are you loving right now? 1. Ban.do just released their new collection and this canvas tote is adorable for a trip to the farmers market. 2. I'm loving the mini bag trend for spring so this Rebecca Minkoff cross body bag is on my wish list. 3. After seeing Sienna Miller in wide leg culottes I'm tempted to purchase this pair from H&M. 4. Have you checked out the West Elm x Kate Spade Saturday collection? This good vibes wall art would be a fun addition to my gallery wall. 5. I recently received a sample of Giorgio Armani 'Si' and now I'm hooked. 6. How adorable are these coffee mugs from Target? 7. Since I'm trying to drink more water this chic S'well crocodile water bottle would be perfect on-the-go. 8. Last weekend I made a trip to Bonobo Winery and absolutely loved their Chardonnay Select. Stay tuned for a full blog post on the winery.